For other uses, see Old Spanish Trail. The Old Spanish Trail (Spanish: Viejo Sendero Español) is a historical trade route that connected the northern New Mexico settlements of (or near) Santa Fe, New Mexico with those of Los Angeles, California and southern California. Approximately 700 mi (1,100 km) long, the trail ran through areas of high mountains, arid deserts, and deep canyons. It is considered one of the most arduous of all trade routes ever established in the United States. Explored, in part, by Spanish explorers as early as the late 16th century, the trail saw extensive use by pack trains from about 1830 until the mid-1850s. The trail is a combination of known trails that were established by Spanish explorers, trappers, and traders with the Ute and other Indian tribes. The eastern parts of what became called the Old Spanish Trail, including southwest Colorado and southeast Utah, were explored by Juan Maria de Rivera in 1765. Franciscan missionaries Francisco Atanasio Domínguez and Silvestre Vélez de Escalante unsuccessfully attempted the trip to California, which was just being settled, leaving Santa Fe in 1776 and making it all the way into the Great Basin near Utah Lake before returning via the Arizona Strip. Other expeditions, under another Franciscan missionary, Francisco Garcés, and Captain Juan Bautista de Anza, then explored and traded in the southern part of the region, finding shorter and less arduous routes through the mountains and deserts that connected Sonora to New Mexico and California, but did not become part of the Old Spanish Trail, with the exception of some of the paths through the Mojave Desert. The Mohave Trail, first traveled by Garcés, from the Mohave villages on the Colorado River westward across the Mojave Desert, between desert springs, until he turned northwestward to the Old Tejon Pass into the San Joaquin Valley looking for a route to Monterey. Garcés then returned to the Colorado following the whole length of the Mohave Trail from the San Bernardino Valley over the San Bernardino Mountains at Monument Peak, down the Mojave River and eastward to the Colorado River. The same trail was used by the first Americans to reach California by land, the expedition led by Jedediah Smith in November 1826. The Mojave desert section of the Mohave Trail is now a jeep trail called the Mojave Road. A route linking New Mexico to California, combining information from many explorers, was opened in 1829-30 when Santa Fe merchant Antonio Armijo led a trade party of 60 men and 100 mules to California. Using a short cut discovered by Rafael Rivera the previous year, the Armijo party was able to stitch together a route that connected the routes of the Rivera and Domínguez-Escalante Expeditions and the Jedediah Smith explorations with the approaches to San Gabriel Mission through the Mojave along the Mojave River. Upon the return of Antonio Armijo, the governor of New Mexico immediately announced the success to his superiors in Mexico City. As a reward, the governor officially named Armijo "Commander for the Discovery of the Route to California". Armijo's route was documented by him in a report to the governor, and published by the Mexican government in June 1830. After this date, the route began to be used by traders for usually a single annual round trip. Word spread about the successful trade expedition and some commerce began between Santa Fe and Los Angeles. However, in 1830, due to resumed hostilities with the Navajo, the Armijo route west to the Colorado River Crossing of the Fathers was not practical, and a new route north of the river had to be found, which used the trails of the fur traders and trappers of New Mexico through the lands of the Utes. This route ran northwest to the Colorado and Green Rivers, then crossed over to the Sevier River, which it followed until crossing westward over mountains to the vicinity of Parowan, Utah. It then passed southward to the Santa Clara River, linking up with Armijo's route to California. This commerce usually consisted of one mule pack train from Santa Fe with 20 to 200 members, with roughly twice as many mules, bringing New Mexican goods hand-woven by Indians, such as serapes and blankets, to California. California had many horses and mules, many growing wild, with no local market, which were readily traded for hand-woven Indian products. Usually two blankets were traded for one horse, more blankets were usually required for a mule. California had almost no wool processing industry and few weavers, so woven products were a welcome commodity. The trading party usually left New Mexico in early November to take advantage of winter rains to cross the deserts on the trail and would arrive in California in early February. The return party would usually leave California for New Mexico in early April to get over the trail before the water holes dried up and the melting snow raised the rivers too high. The return party often included several hundred to a few thousand horses and mules. Low-scale emigration from New Mexico to California used parts of the trail in the late 1830s when the trapping trade began to die. New Mexicans came to settle in Alta California by this route, some first settled in Politana then established the twin settlements of Agua Mansa and La Placita on the Santa Ana River the first towns in what became San Bernardino and Riverside Counties. The family of Antonio Armijo moved to Alta California and his father acquired the Rancho Tolenas. A number of Americans, most naturalized Mexican citizens in New Mexico, formerly in the California trade over the Old Spanish Trail or in the fur trade settled in Alta California and became important citizens in later years, like Louis Rubidoux, John A. Rowland, William Workman, Benjamin Davis Wilson, and William Wolfskill. The trail was also used for illicit purposes, namely to raid the California ranchos for horses and for an extensive Indian slave trade. These horse raids were made by Mexicans, ex-trappers and Indian tribes, primarily the Utes, most famously Walkara, who together stole hundreds to thousands of horses in one raid. Native Americans, especially the Paiutes along the route of the trail, usually women and children, were captured and sold to Mexican ranchers, etc., in both California and New Mexico for domestic servants. Mexican traders and Indian raiding parties both participated in this slave trade. The consequences of this human trafficking had a long-standing effect for those who lived along the trail, even after the trail was no longer in use. Intermittent Indian warfare along the trail often resulted from these slave raids by unscrupulous traders and raiding Indians. John C. Frémont, "The Great Pathfinder", took the route, guided by Kit Carson, in 1844 and named it in his reports written up in about 1848. New Mexico-California trade continued until the mid-1850s, when a shift to the use of freight wagons and the development of wagon trails made the old pack trail route obsolete. By 1846 both New Mexico and California had become U.S. territories as a result of the Mexican–American War of 1846–1848, and after 1848 large numbers of Mormon immigrants were settling in Utah, Nevada, and California all along the trail, affecting both trade interests and tolerance for the slavery of American Natives. Place names used in this article refer to present-day states and communities. Few (if any) settlements existed along the trail, except in the coastal plains of Alta California, before 1850, although many of the geologic features along the Trail retain their Spanish designations. 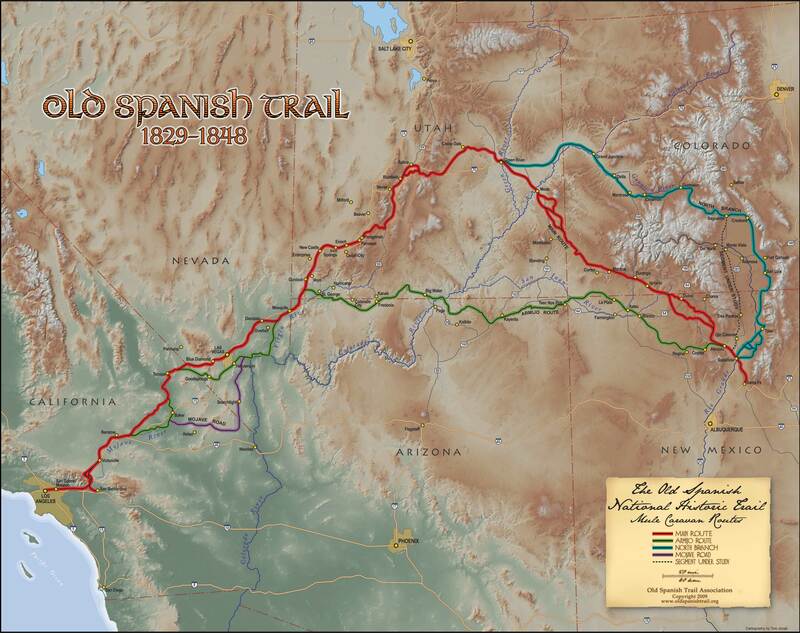 The Armijo Route of the Old Spanish Trail was established by an expedition led by Antonio Armijo in 1829-1830. Leaving on November 7, 1829 Armijo's expedition traveled a route northwest and west of Santa Fe from Abiquiu, following the Chama River and the Puerco River, and he crossed to the amazing San Juan River basin. From the San Juan they entered the Four Corners area, passed north of the Carrizo Mountains to Church Rock, east of present-day Kayenta. The trail then ran to Marsh Pass and north through Tsegi Canyon into canyon country and to the Colorado River (then called the Rio Grande), where the travelers forded at the Crossing of the Fathers above present day Glen Canyon Dam. Continuing west to Pipe Spring and on to Virgin River above present day St. George, Utah, the expedition then followed the Virgin to the mouth of the Santa Clara River, which they followed up to the vicinity of the Shivwits Reservation. They then crossed southward over the Beaver Dam Mountains, at Utah Hill Summit to the Virgin River again, which they followed for three days down to the Colorado River, before turning west parallel to the river, over difficult terrain in the Black Mountains, to avoid the deep narrow gorge of Boulder Canyon, to the riverside oases of Callville Wash and Las Vegas Wash. Armijo waited there for his scouts to return, especially Rivera who had visited the Mohave villages down river before. Rivera returned, having recognized the Mohave Trail that led westward to Southern California. Perhaps because of the belligerence of the Mohave to parties of mountain men in recent years, or merely to save time, Armijo attempted a short cut route southwest to the mouth of the Mojave River. By now short of food, Armijo sent some of his scouts ahead to get more food in the settlement at San Bernardino de Sena Estancia. They followed the river for six days (110 miles to its head from the mouth), having to kill a mule or horse each day to eat. Probably at Summit Valley at the top of the river, east of Cajon Pass they met vaqueros of the San Bernardino de Sena Estancia with food. Armijo did not cross over the mountains by the Mohave Trail route over Monument Peak, but followed a route he called "Cañon de San Bernardino" from the upper Mojave River west through Cajon Pass and down Crowder Canyon and Cajon Canyon to the mouth of Cajon Pass, where the trail reached the coastal plain of San Bernardino Valley, a route no doubt known to the vaqueros of San Bernardino Estancia. Once through the pass, they turned west along the foot of the San Gabriel Mountains for two days to San Jose Creek, then following it to cross the San Gabriel River at the Rancho La Puente, reaching Mission San Gabriel Arcángel on January 30, 1830. Armijo returned by the same route between March 1 and April 25, 1830. He submitted a brief journal of his journey (itemizing the days with names of places where camps were made but with no distances) to the government of New Mexico, and it was published by the Mexican government in June 1830. The North Branch of the Old Spanish Trail was established by traders and trappers using Indian and Spanish colonial routes. It ran from Santa Fe north to Taos and on north into the San Luis Valley of Colorado. Caravans then headed west to today's Saguache, crossing over the Continental Divide at Cochetopa Pass, and then through present day Gunnison and Montrose to the Uncompahgre Valley. The trail then followed the Gunnison River to today's Grand Junction, where the Colorado River was forded, and then on west to join the Main Northern Route just east of the Green River. The North Branch later became an interest of explorers seeking viable routes for a transcontinental railroad along the 38th parallel. In 1853 alone, three separate expeditions explored the North Branch over Cochetopa Pass. These groups were led, in order, by Lieutenant Edward Fitzgerald Beale, Captain John Williams Gunnison, and John C. Frémont. Use of the Old Spanish Trail between 1829 and 1848 resulted in numerous variations as travelers adopted or blazed easier paths. But regardless of the route taken, the Old Spanish Trail crossed several mountain ranges, passed through dry sections with limited grass and sometimes limited water, crossed two deserts, and was often littered with the bones of horses that had died of thirst. The western portions of the Old Spanish Trail could only be used semi-reliably in winter when rains or snows deposited water in the desert. In summer, there was often no water and the oppressive heat could kill. A single round trip per year was about all that was feasible. After 1848, the western parts of the trail were used for winter access between Utah and California when other trails were closed by snow. Another cutoff to the Armijo route of the Old Spanish Trail had developed before 1844, where the trail forked northeastward from the Mojave River and Mohave Trail, east of what is now Yermo, California, running up Spanish Canyon over Alvord Mountain, to Bitter Spring, then through Red Pass to join the Armijo route near Salt Spring in the Silurian Valley. Frémont also used this route in 1844.:261–264 The fork of the trails there on the Mojave River, later became known as Fork of the Road. In 2001, the section of the Trail that runs across Nevada from the Arizona border to California was placed on the National Register of Historic Places as the Old Spanish Trail/Mormon Road Historic District. Although few traces of the early traders' trail remain, the Trail is now commemorated in many[which?] local street and road names, and numerous[which?] historical markers in the states that it crossed. Portions of US 160 in Colorado and US 191 in Utah are similarly designated. ^ History of The Old Spanish Trail MuseumTrail.org, San Luis Valley Museum Association. Retrieved on 2008-08-05. ^ Le Roy Reuben Hafen; Ann Woodbury Hafen (1954). Old Spanish Trail: Santa Fé to Los Angeles : with Extracts from Contemporary Records and Including Diaries of Antonio Armijo and Orville Pratt. University of Nebraska Press. pp. 109–129. ISBN 978-0-8032-7261-3. ^ a b c d e f g Warren, Elizabeth von Till. "The Old Spanish National Historic Trail." Archived 2016-04-21 at the Wayback Machine Old Spanish Trail Association. Reproduced from Pathways Across America. (Summer 2004) by the Partnership for the National Trail System. ^ a b c d e National Park Service (2001). Old Spanish Trail National Historic Trail Feasibility Study and Environmental Assessment. ^ Warren, Elizabeth von Till (1974). "Armijo’s Trace Revisited: A New Interpretation of the Impact of the Antonio Armijo Route of 1829-1830 on the Development of the Old Spanish Trail." (MA thesis). Las Vegas, Nevada: University of Nevada, Las Vegas. ^ New Map Of The Territory Of Arizona, Southern California And Parts Of Nevada, Utah And Sonora., Payot, Upham & Company, San Francisco, 1877. from davidrumsey.com accessed November 19, 2015. ^ Mehls, S.F. (1986). "Old Spanish Trail". Classified Structure Field Inventory Report-National Register of Historic Places Registration Form. National Park Service. Retrieved 2009-05-03. ^ "National Register of Historic Places". Retrieved 2007-05-30. ^ McBride, Terri with Stanton D. Rolf (2001). "Old Spanish Trail-Mormon Road Historic District". National Register of Historic Places-Registration Form. National Park Service. Retrieved 2009-04-26. This page was last edited on 26 February 2019, at 03:02 (UTC).